Q: Salvation City begins at a time in the near future after a global flu pandemic has killed large numbers of people, including both parents of the thirteen-year-old main character, Cole. To what extent would you say your novel belongs to the genre of apocalyptic or dystopian fiction? A: My book certainly has elements of both those genres, but it’s also different. Salvation City is really about a near apocalypse and a temporarydystopia. The pandemic is catastrophic, but it doesn’t destroy civilization and most of life on earth, as happens in classic apocalyptic fiction. The disease passes, and life goes on, which is of course what happened after the 1918 flu, the worst disease outbreak in history. In classic dystopian fiction, like 1984, the whole point is to portray the grim, hopeless future that awaits us if we don’t change our evil ways. There’s something of that in my book, which shows what could happen in the event of a pandemic, given how unprepared we are for such a crisis. But though the flu convulses and radically changes America, it doesn’t create some new repressive state as happens in most dystopian fiction. And though I’m interested in the effects of the flu on society, my main concern is how one young boy tries to find his way after being deathly ill, then stranded in an orphanage, and then sent to live in a community completely different from the one he grew up in. Q: Did your decision to write about a flu pandemic have anything to do with the outbreak of the H1N1 swine flu virus? A: No. I started writing this novel in 2006, two and a half years before the swine flu outbreak. Whenever I start a new book I always begin with a character, or a few characters, whose story I want to tell, and I’ve always been interested in writing about people who are facing some kind of extreme situation. I knew I wanted to set the story in the near future so I could play with certain “what if” ideas, something I hadn’t done before, and I knew, of course, that another pandemic like the Great Flu of 1918 was a real and perhaps even imminent possibility. Still, when the swine flu began I was as alarmed as everyone else, and surely more terrified because of all the time I’d just put in imagining the worst. I was doing final revisions then, and for a couples of weeks I was paralyzed, not knowing what to write, or rewrite, while watching the real thing unfold minute by minute. Q: Why did you choose to write about a young male protagonist this time when in the past most of your fiction has been written from a woman’s perspective? A: I wanted to write a novel in which the main character was male simply because it was something I hadn’t done before. And, for the story I wanted to tell, an adolescent protagonist appealed to me. I wanted a character who wasn’t yet set in his beliefs, because Salvation City is largely about the search for belief. And I wanted someone still uncertain about what love means—family love, romantic love—and who doesn’t yet know what he wants to be in life. Cole spends a lot of time drawing comics, for which he has a real gift, and which is his major consolation through bad times. You can easily imagine him growing up to be a graphic novelist. But like most boys his age, he fantasizes a lot about being a hero, and the theme of heroism is very important to the story. Q: To what extent have you written an archetypal coming of age story, albeit one set in extreme conditions? Would it be too glib to see parallels with both J. D. Salinger’s The Catcher in the Rye and Cormac McCarthy’s The Road? A: I guess all coming of age stories are going to have elements in common. Cole and Holden share a certain amount of serious teen angst and alienation and considerable disgust for adults. But Holden’s three years older than Cole—big difference. Cole isn’t anywhere near as knowing, ironic, and even cynical as Holden can be. And unlike Holden, Cole, having lived through such harrowing, life-changing events, is a very different kid at the end of the book than he is at the beginning. As for The Road, it’s not really a coming of age story but rather an adventure and epic-journey story. Cole’s on a journey too, but it’s mostly a journey inward. I see him as a young seeker, and much of the book is about his moral and spiritual growth. Q: Cole’s parents are secular liberals while the couple who take him in after he is orphaned are evangelical Christians – about as different as they could possibly be. How hard is it for Cole to come to terms with these vast differences? A: It’s very hard, especially since he comes to have such loving feelings for Pastor Wyatt and his wife, Tracy. Perhaps the hardest thing for Cole is that, in his new community, everyone believes that if a person dies without being saved—and the only way to be saved is to worship Jesus—he or she is condemned to eternal suffering. Cole has to decide whether or not to accept this as the truth about his own parents, one of whom was Jewish and neither of whom believed in any religion. And if he can’t bring himself to accept this, how can he still belong among the believers? Q: In your novel, one of the most insidious features of the flu is that, in the case of some survivors, it erases their memories. Is it fair to say that Cole’s challenge is to avoid the twin dangers of becoming trapped in the past and forgetting it? A: Very high fever, which is a symptom of flu, can cause some memory loss. But we’re not talking about serious, lasting amnesia. In Cole’s case there’s the added trauma of having lost both parents. It takes some time before he recovers enough to remember the recent past accurately. I don’t think he’s in danger of being trapped in the past or of forgetting it, exactly. I think the real challenge is for him to hold on to his parents once he’s been placed in a home and town where no one wants to talk about them, and where in general people are fixated on the future and believe it’s bad to dwell on the past. As time passes, Cole finds that his parents seem more and more distant from him and he even starts having trouble remembering exactly what they looked like. This is very painful and confusing to him, but of course that’s often what happens when we lose people, no matter what the circumstances. Q: Although Cole is a smart and sensitive boy, he admits that he hates reading and has in fact never read an entire book. Is this, like the threat of a global pandemic, something you fear about the future? Q: Cole refers to the sexiest girls as “apocalyptic.” Is this an intentional irony on his part, or yours? Q: Through Cole’s eyes, you appraise the strengths and weaknesses of both sets of parents in a balanced way. There is even a surprising amount of agreement between them in certain areas. In particular, your generally sympathetic portrayal of the evangelical Christians is not something one finds in many books by critically acclaimed novelists. Was it hard for you to write even-handedly about such opposing sides? A: Trying to write about people with very different beliefs was no harder than it always is to create convincing characters. And I always thought what I was doing was writing about individual human beings rather than about “sides.” I love good satire, but I’m not a satirical writer myself, so I wasn’t interested in creating characters meant to stand for types. I wanted to present the characters as fully as possible. Of course I’m interested in my characters’ political and religious beliefs, but I feel I have to go deeper than those beliefs to give them their full humanity. What this usually requires is exploring how the characters relate to one another. Q: What is the Rapture, in Christian theology? And why are the people of Salvation City so ready to welcome it? A: Many Christians believe that, just before the Apocalypse, the saved will ascend bodily to heaven and thus be spared the tribulations of the final battle between good and evil. Christians like those in Salvation City believe that the world has become so perverse and corrupt that it’s clearly time for it to end and for Christ’s reign—which will bring eternal peace and joy to the saved and reunite them with dead loved ones—to begin. Q: What are “rapture children,” and how do they figure in your story? A: This is something I invented. Rapture children are children believed to be endowed by God with special spiritual powers so they can lead others in the countdown to the final battle. I imagined them as a kind of Christian version of New Age so-called indigo children, who are said to possess paranormal powers and extraordinary gifts of intuition and empathy, and whom some people go so far as to call a new, superior type of human being. In my novel, the obsession with rapture children reaches a hysterical pitch in some places with people beseeching the children to pray for them or to advise them in various adult matters. There’s also a growing demand for child preachers. Cole himself is deeply skeptical of these children and their “powers.” Why, he wants to know, are they almost all good-looking and blond? Q: What is your own religious background, and how do you feel it has influenced this book? A: I’m a nonbeliever with a strong curiosity about all kinds of people, including, of course, believers. I have always been fascinated and moved by the figure of Jesus. Who can deny that, if everyone actually followed his teachings, the world would be a far better place? Learning the story of Jesus for the first time in his life, Cole can’t help seeing him as a superhero. Q: Many of the extreme conditions that you describe in this novel of the near future – economic collapse, apocalyptic fervor, violent weather conditions, the outbreak of new diseases, and so on – are very much present in our own time, although much less severely. Do you see your book more as a commentary on present times or as a warning or prediction about the future? A: I don’t think readers need me to warn them about all these perils, which are in the news every day. This is where my book differs from classic dystopian fiction. It’s not a didactic book. 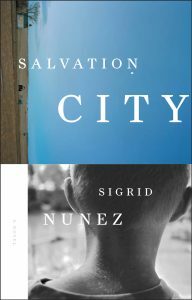 But like most novels, Salvation Cityreflects certain realities about the world we live in, and we do seem to have entered a period of nearly constant crisis, and it seems pretty clear that this state of affairs is likely to endure for some time. Q: In your previous novel, The Last of Her Kind, you wrote about the social and political upheavals of the 1960s, which you lived through. Do you see parallels between that time and the present, or the near-future in which your novel is set? A: The main parallel probably is the polarization of groups, the hardening of positions, the inability of people on different sides to talk to each other, and a tendency among many to automatically demonize whoever doesn’t agree with them. A: I was much influenced by my college professor Elizabeth Hardwick and by Susan Sontag, who was also a mentor. But that influence really had more to do with the vocation of writing than with subject matter or style. Virginia Woolf was a very early influence. But in fact I tend to be influenced at least to some extent by every writer whose work I admire, so the list is endless. Q: What do you hope readers take away from Salvation City? A: The feeling that it was a good read, above all, and that it had something honest and meaningful to say about our world and about human experience. The desire to go immediately and read another book—and I mean any book, not necessarily another one of mine. That would be the highest compliment.